Will Melaka’s latest destination marketing effort feel the love? Malaysia’s first love-themed harbour “Love Harbour Melaka at The Riviera” recently launched in Melaka, offering wedding planner services and bridal shops, as well as featuring classical European architectural design houses and businesses. Unveiled by Mythas Legacy and First Avenue Partners, the harbour strives to become a major tourist attraction both locally and internationally, Mythas Legacy’s CEO Hedki Heng said. This is in a bid to boost tourism and economy in Melaka and the country. In a statement to A+M, a spokesperson for Mythas Legacy said it is casting a “wide net” in terms of the tourist demographic it attracts. It not only targets tourists from neighbouring Southeast Asian countries such as Singapore, but also other countries within Asia Pacific such as China. The spokesperson added that one of the advantages Love Harbour has is Melaka’s rich cultural heritage, and that Mythas Legacy is not targeting a specific age group with Love Harbour. This is because it offers activities for all walks of life, including families, couples and middle to upper income groups. In a statement to A+M, Luke Lim, CEO of A.S. Louken described the love-themed concept as a “good idea” which adds on to the strength of Melaka, as it is already known for its food, heritage and architecture. He said that the Love Harbour will increase the romance and charming appeal of the state. Great ideas must always go along with great execution. “If this is executed well, it will bring in tourist dollars, and an added additional layer of competitive advantage competing against its peers in the region with similar attraction points,” he said. Also weighing in on the topic was Nick Foley, APAC president of Landor, who said weddings are always a lucrative industry to focus on, adding that Melaka is a new and unexpected destination among the usual suspects such as Bali, Koh Samui and Santorini. “In many ways, Melaka is multifaceted and its colonial past and link to the Portuguese only makes it more appealing due to the sense of discovery,” Foley said. 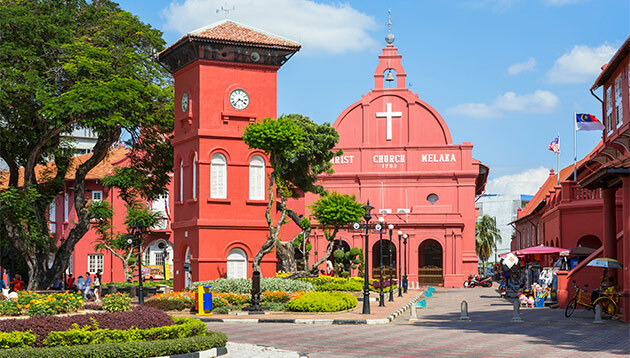 Melaka has a history that distinguishes it from island resorts. This is useful from a brand positioning perspective. He added that newly-weds will enjoy the sense of “discovery” that goes with Melaka, as it is known for more than just tourism, as compared to other wedding destinations in Southeast Asia. Foley also said that the Malaysian Government should use Melaka’s past as a key element when promoting Love Harbour Melaka. “Perhaps the appeal of Melaka is that it is more granular and real. Leave ‘classy’ to other Southeast Asian destinations,” he added. Melaka has a history that distinguishes it from island resorts, which is useful from a brand positioning perspective and allows the state to differentiate itself from other destinations. In many ways it can offer the best of both worlds, Foley said. Authenticity is what most tourists are craving for today. Melaka has loads of it and that’s what they should be reinforcing. “If done well, Love Harbour Melaka can go a long way in attracting a younger demographic to Melaka, which would help diversify its tourist base beyond families,” Chaudhry said. He added that Love Harbour Melaka presents an interesting opportunity as retail moves to being more experiential. With the right tenants, retail and experiential mix, Love Harbour Melaka could well stand out across the region. Also, the favourable price-value equation that Melaka presents can potentially be an attractive option to tourists. Chaudhry also said that the Malaysian government should do all it can to preserve the heritage, refurbish cultural sites in Melaka and improve infrastructure to better enable people to get the most out of their Melaka experience. “Never underestimate the power of single-mindedness especially when it comes to tourist destinations. Simplicity is key for placemaking as destinations need to attract large and diverse audiences from different markets,” he said.